?> Pure white linen in a variety of thicknesses. 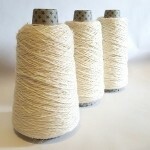 This strong white Linen is ideal for all different crafts requiring a strong, smooth yarn. 200g cones of very strong white (undyed) pure linen in a range of thicknesses. 100&percnt; pure white linen is twisted up to create strong, versatile yarns in a variety of thicknesses. 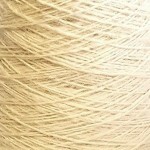 In order to provide a range of weights we source our yarns from anywhere we can in their single form and ply them up. 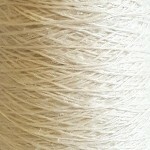 The single, fine linen we use varies in thickness and character so in order to produce a range some yarns may only need 3 strands and others need many, many more, some are hairy and some are smooth. Due to the nature of how we make our yarns the weights of these vary from batch to batch along with the colour and character which may be whiter or creamier, smooth or hairy. Hence the necessity for stating a wide ranging meterage of yarn on these spools. Please ensure you order enough linen to complete your project as we cannot guarantee that the next batch will be exactly the same. If you require a regular, repeatable linen we suggest choosing the Dublin which is made to our specifications with first quality linen. 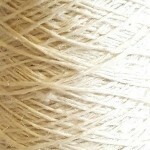 Linen is ideal for all different crafts requiring a strong, smooth yarn. Though its handle is a little crisp, it transforms after wear and washing, so don’t be put off by its slightly ‘stringy” feel as some tough love will change it dramatically. The nice bleached white or creamy colour means the yarns can all be dyed easily with cold water dyes into bright, fresh colours of your own choice. 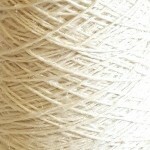 Linen makes a particularly good weaving yarn in both the warp and weft for all types of loom. Make placemats, table linen, tea towels, cushion covers and bags. Braids, tassels, knotting and macrame are very successful when made from linen as stitches can be seen clearly and linen has a nice drape and weight. Also useful as a general “string” around the house or garden, though will eventually discolour and rot over time with long exposure to the sun. Though the thicknesses vary they can all be crocheted, and knitted by hand or machine (on a standard gauge machine) as between a 2ply and DK (approx.) Once made throw in the washing machine and tumble drier and it transforms into a soft, wearable yarn that is perfect for spring and summer pieces. A yarn that’s difficult to source in a variety of weights at such a great price. Repeatable, but not necessarily in exactly the same textures. All Approx: Fine (3ply) - Knit on 3mm pins - 32 stitches and 40 rows, Medium (4ply) - Knit on 3.25mm pins - 28 stitches and 36 rows, Heavy (DK) - Knit on 4mm pins - 22 stitches and 28 rows - to a 10cm square.